Claire Parker, Director of Out Of School Partnership and Owner of School’s Out has written about her journey with Connect Childcare. So, when I started my ‘little’ after school club in 2008 numbers were low, with just a handful of children. I went out and purchased my first receipt/invoice book and each month wrote out manual invoices for the children booked into sessions with me. I watched with delight as the number of invoices gradually increased month on month. I remember the first month that I actually invoiced for enough money to cover the cost of my staff bill and felt a sense of achievement. A couple of years later I happened to be talking to my sister-in-law (who is an organised woman) and mentioned how long it took me each month to do my invoicing. She suggested that I purchase some accounts software, to make this process more efficient. After mulling it over for a few more months, I eventually went out and bought a basic accounts package with Sage. The so called organised sister-in-law was very good and even helped me to put all my customer’s details onto the system. I have to say, once this was done…life did feel a little easier for some time. I just had to tot up the number of sessions each child would attend each month and make sure I included these into the relevant bill and ‘voila’ Life was good. As time passed by, my business continued to grow and my poor old laptop started to have issues. I discovered I could not just purchase a new one, as the software was not compatible with newer versions of Windows. I, therefore started to consider some of the online options…of which I discovered there were many. I had actually looked at Connect’s software a couple of years before purchasing it but decided it was too expensive and therefore didn’t make the purchase. By 2017, I was starting to tear my hair out with the amount of time I would spend each month on invoicing…often it would take over a whole weekend to get right, relying on copious amounts of notes for ‘extra sessions’ ‘altered sessions’ ‘later pick ups’ etc. I would also know that some things would be missed each month, as I couldn’t possibly remember and add every change. Sometimes when you are busy and something isn’t going right, it is easier to carry on as you are, instead of putting the effort into changing what you do…as it usually means more work. Even so, I knew I had to make this move soon. One day I was talking/moaning to Siobhan (from OOSP) about my dilemma and she suggested that I look at Connect., mentioning that it would save me so much time. I explained that I had looked previously and that a) I thought it was quite expensive, b) that it did far more than I needed. She told me that her OOS club’s invoicing took about 10-15 minutes for multiple sites, as everything is booked onto the system as you go along. I have to say, I did think that sounded appealing. The following month, after looking at various other options I decided to speak to Connect again for a costing, only to find that they actually offered a reduced and far more reasonable rate for out of school clubs, as they recognised that we wouldn’t use the whole software package. I couldn’t leave it any longer and decided to take the plunge, making the purchase in November 2017. My plan was to be up and running by January this year. So…here we are in January and I have to say It has been a bit of work to get all of our customers/children’s details onto the system (I was lucky to find a very efficient administration person who kindly helped to put all of this on for me) but I’m very pleased to report that we raised our first invoicing run last week and all of these went straight out by email to the parents, which was a bonus in itself. We are now getting used to using the system on a daily basis, ticking off registers, as well as adding any adjustments. I’m still learning and often call Connect with queries…..but have to say their support line has been first class. Whoever I have spoken to, they have been amazing and nothing has been too much trouble. I am learning new skills every day and one of the best bits for me is that I know this system does so much more than I currently use it for, so it can grow with me as I need it, instead of me having to look for a new system again in the future. I am certain that I’ve made a great decision in investing in this software and am confident it can help other Out of School Clubs like mine to save so much time (and stress!). So confident in fact that I have now managed to secure a brilliant deal for our members. 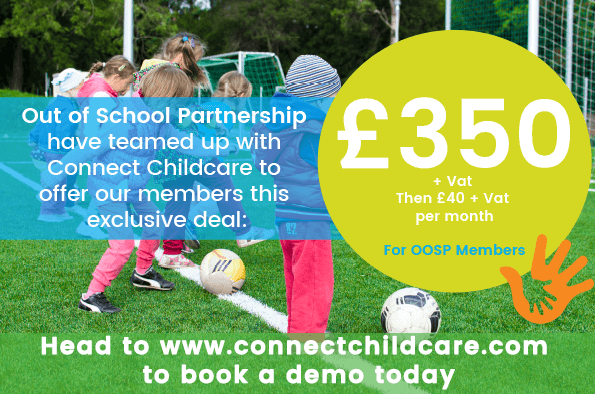 OOSP members can benefit from Connect Childcare’s award-winning childcare management software package for just £350 + Vat and £40 + Vat per month. This is a huge 50% off deal and is exclusively for our member base. I will continue to blog about my journey with Connect so you can follow my progress and hear first hand what difference it makes to my business.